Coco Peat Blocks are procured from the superior quality coconut husks. Our Coco Peat Blocks are free from weeds, stones, sand and other undesirable foreign bodies. The Coco Peat Blocks find applications in horticulture and agricultural applications to enhance the healthy growth of plants. 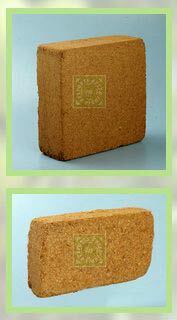 Clients can avail these Coco Peat Blocks in different specifications as per their needs. We are well-known Manufacturer, Exporter and Supplier of Coco Peat Blocks based in Tamil Nadu. Coco-peat, also known as coir pith or coir dust is a bi-product of the coconut industry and is produced when coir fibre is extracted from the coconut husk. It is a spongy, peat like residue. It is a direct substitute to mined peat and hence is used extensively as a substrate in the horticulture sector. Coco-peat when first produced is light tan colour, but darkens with age to a dark chocolate brown colour. Coco-peat is packed and exported as compressed 5 kilogram blocks and 650 gram briquettes and palletized during shipment.